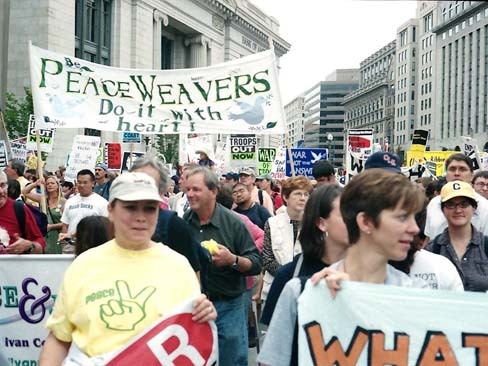 After a hiatus of more than a year, the anti-war movement surged back into the streets on September 24, 2005. Diverted into the cul-de-sac of the Kerry campaign, which saw the fervently anti-war let their equally fervent anti-Bush sentiments overwhelm a rational look at the pro-war Kerry Democrats, “the other super-power” has been re-ignited into action by the deepening carnage in Iraq, the bravery of Gold Star Mother Cindy Sheehan and the malevolent negligence of the Bush government’s response to the victims of Hurricane Katrina. 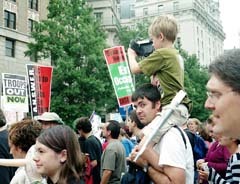 So when this reporter and his family drove up the Albany, New York hill to the dark corner of Madison Avenue and Eagle Street, the large crowd waiting for the buses came as no surprise. 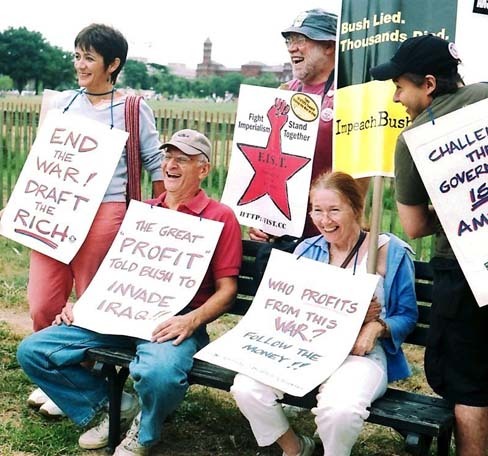 Indeed, Capital District anti-war organizers had been frantically scouring the region for available buses ever since the beginning of planning for the 24th. After several anxious days, three buses were secured from a New Jersey company. It seemed that every available bus in the Northeast was booked for Washington, DC this weekend. The passengers on the reporter’s bus were a mix of the usual veteran anti-war suspects and new, mostly young faces. Every seat was taken, with some quarreling emerging over the last seats to be filled. This was a far cry from the single bus with some empty seats that carried anti-war diehards to the Million Worker March of October 17, 2004. 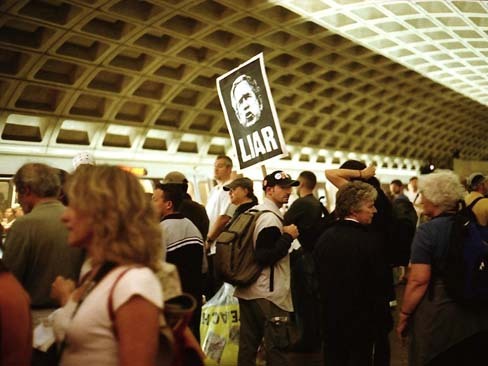 If there were full buses then, they were headed to New Hampshire or Pennsylvania, to campaign for “Reporting-for-Duty” Kerry. point after the rally, we marched off to find coffee and breakfast. When we arrived in Washington at 8 a.m., other groups of protestors has already spread along the sidewalks, brightening the gray dawn of a gray day with banners and signs at the ready. After recharging with coffee, some of which this reporter managed to spill on himself, to the great amusement of all, we trundled off to the rally assembly point. It was between 10 and 11a.m., and already the ellipse was filling up. We greeted Stan Goff, who we had met at his Hudson, New York talk last spring. We explored some of the display tents. A particularly disturbing tent had a trail made up of shoes — shoes of Iraqis killed in the invasion and occupation. 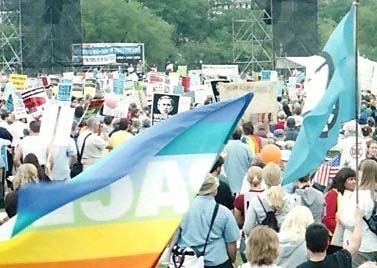 After some mistaken directions left us thinking we had good seats at the rally, which was actually the site for the after-march event, we joined the morning rally where we heard George Galloway and Cindy Sheehan among others. As the appointed time for the march approached, people became restless and even booed at the announcement of more speakers. Many had filed out by the time such luminaries as Jessica Lange and Ralph Nader had their turn at the podium. 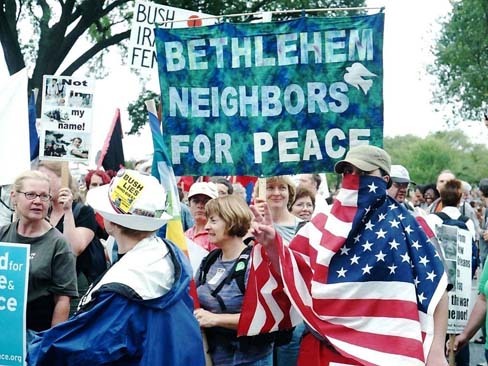 Then it was off to the march, where we stumbled on the Albany contingent, gathered around the “Bethlehem Neighbors for Peace” banner. It seemed to take forever for the march to begin. There was time to assess the signs brought by participants, which ranged from those of organized groups to individual efforts. 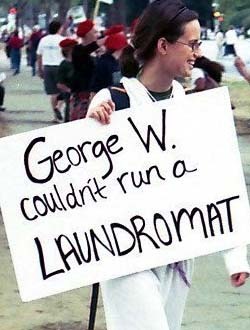 As in past anti-Iraq war actions, creative placards were abundant. I made it my days mission to photograph as many of the home-made signs as I could. The crush of marchers was so great that it made moving away from our little subgroup perilous, even in the brief seconds it took to snap off a shot of a witty sign. As we passed the White House stretch of the march route, we became hemmed in by the long steel fences made infamous in New York City. DC police stood behind them wielding four-foot-long wooden truncheons. I grabbed a photo of a young policewoman standing nervously by herself, looking like Jennifer Lopez in uniform, struggling to remember her lines. The march moved very slowly as we neared the White House, and the clock began to count down to our departure time for the bus ride back. For a few minutes we feared being trapped near the White House by the police and fences. We were able to escape after we passed the White House into Lafayette Park. 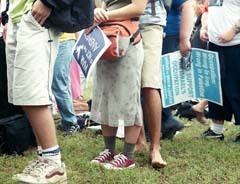 It was filling with exhausted marchers, some like one elderly man lying stretched out in sleep. 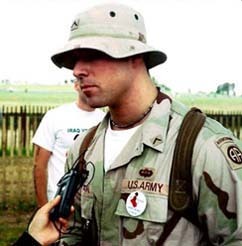 Everywhere we went, the occupying army of anti-warriors was spreading out, searching for restrooms and food. It was then that we saw one of the most remarkable signs carried on the march. 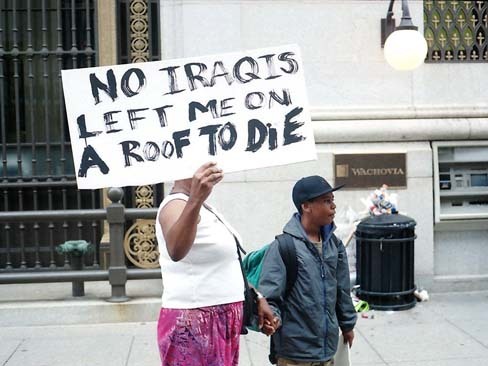 A black woman and her child were walking with a sign that said, “NO IRAQIS LEFT ME ON A ROOF TO DIE.” We asked her if she was from New Orleans. She said no, but her heart was there. We found a closed outdoor café near a Metro station. Several of us used a nearby Subway shop for our restroom/food stop. We spoke in the line with some Iowans who told us that three busloads from that state that they knew of had made the twenty-hour trip to DC. I marveled at the skill of the Hispanic food service worker who deftly finished our subs and cashed us out without blinking at the endless line before him. Then there was the mass exodus on the Metro system to the buses. A human tide, many still carrying signs and banners, swept through the gates and down the steps where it crashed into the trains which quickly jammed up to capacity. The Metros Green Line was now fully occupied. Spontaneous chants broke out several times. 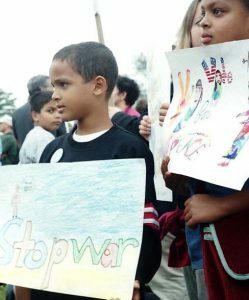 I say this because the leading Democrats lined up for the 2008 election, most prominently Hilary Clinton, clearly support continuing the war. Clinton actually wants to send more troops and is positioning herself to be acceptable to the military establishment. Her name drew boos and hisses at the Albany meeting of the Bring Them Home Now Tour on September 17. Environmental devastation piled onto imperial devastation has raised the stakes considerably. 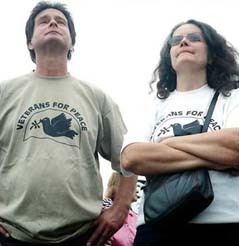 There is less wiggle room for those who would seek to divert anti-war sentiment once again. It is a critical moment for those of us who hope to lead US working people in a different direction.